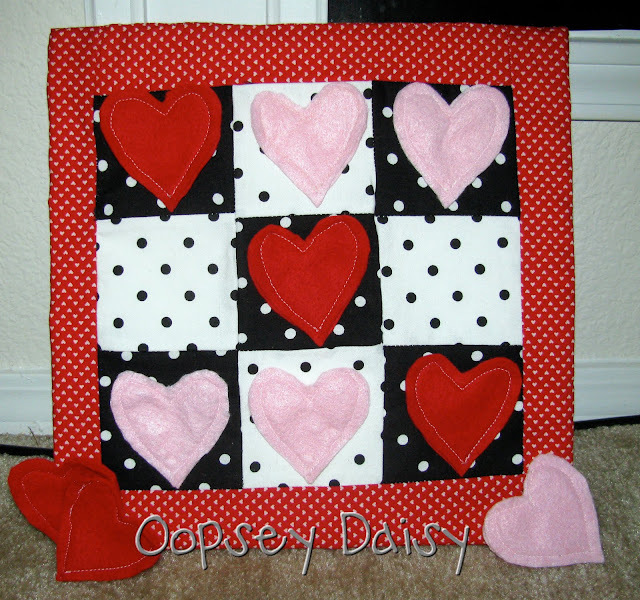 Tic Tac Toe: 3 Hearts In a Row! 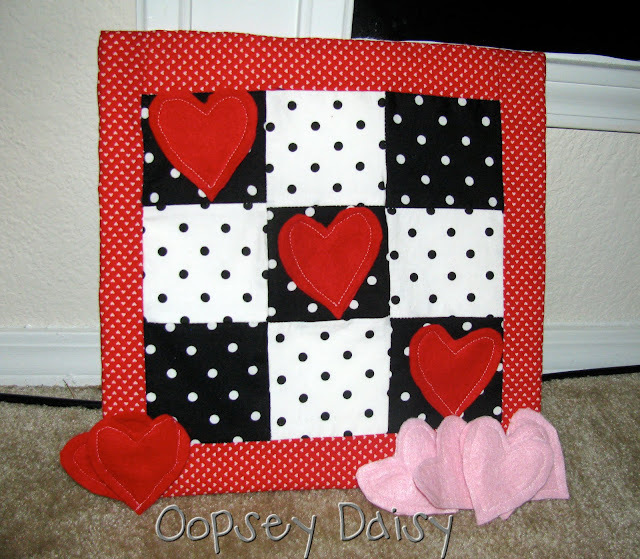 You are here: Home / felt / Tic Tac Toe: 3 Hearts In a Row! Let's start with the front. I wanted a checker-board look to the front of the board. I needed 9 squares, so I cut 4 white squares and 5 black squares and arranged them into a tic-tac-toe pattern. 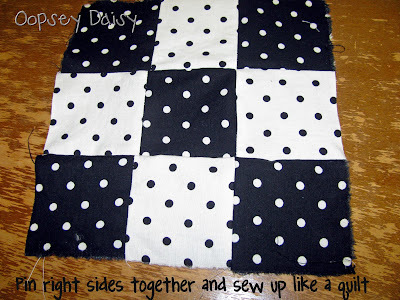 Then I cut 4 strips of fabric to line the 4 sides of the checkerboard. 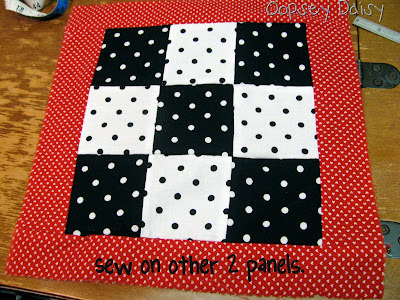 Next, I pinned 2 of the strips to 2 sides of the checkerboard, right sides together. 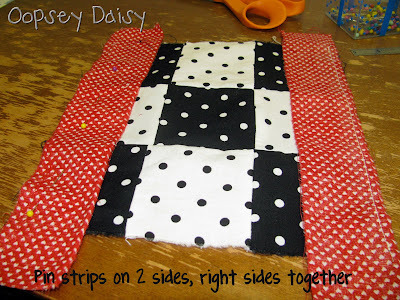 Sew those together and cut off the ends of the strips so they are even with the checker board. 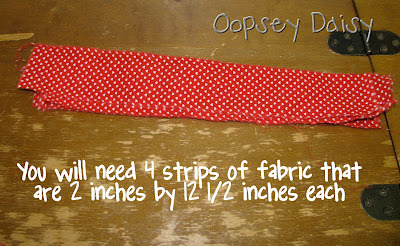 Now sew on the other two strips, and the front is done! Don't forget to press open those pesky seams. 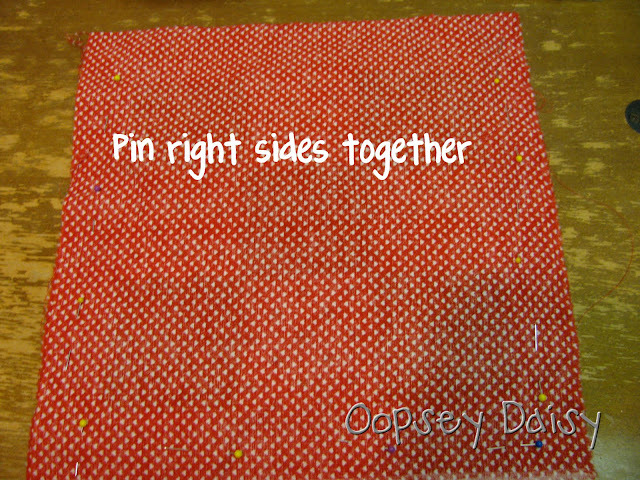 Then I sewed up 3 sides of the square, leaving 1 entire side open and snipping corners. 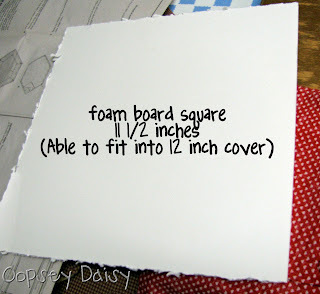 The inside of the tic-tac-toe board is a foam board square. I cut it 11 1/2 inches by 11 1/2 inches to be sure it would fit into the fabric cover, and it did. Nice and snug! Hooray! 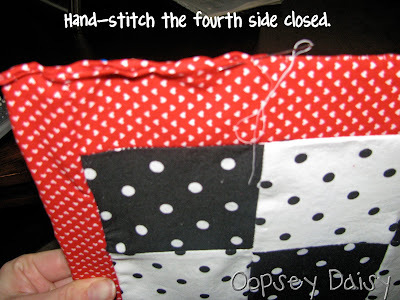 The fourth side has to be sewn up by hand. I did it last night while watching American Idol. 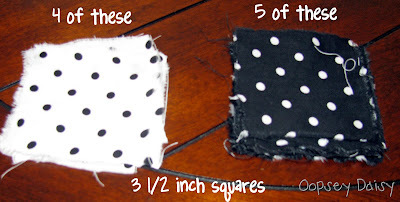 There are so many cute things you could make for the tic-tac-toe pieces. If I was a truly patient person, I would have done X's and O's. Instead, I just did red and pink hearts. 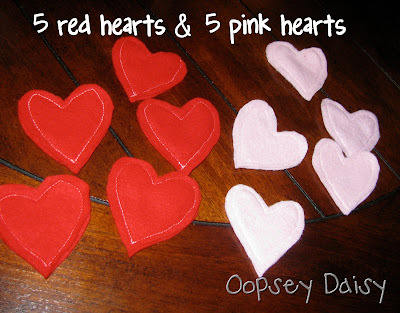 I wanted them to be thick, so I cut out 5 pairs (10 total) of red hearts and 5 pairs (10 total) of pink hearts. I used a 3-inch heart template to cut them. I just pinned 2 hearts together, and stitched all the way around. Now play tic-tac-toe to your heart's delight!! 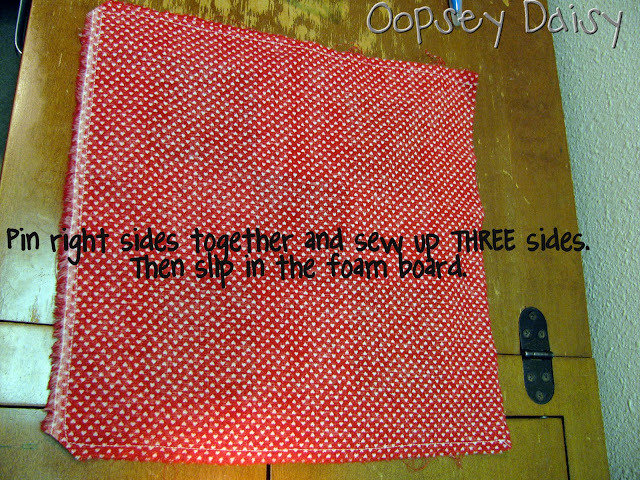 PS This was my first sewing tutorial, so leave me a comment if it does not make sense! Your ideas are amazing. I had a friend over today and was showing her your blog. You need to move closer so we can hang out more. That is such a cute idea! I used your tutorial to make a tic tac toe thing for my quiet book. Thanks so much! You are so creative.